Now this story is coming out though - NO MORE COVERUPS. NO MORE INFLUENCE PEDDDLING - no more government collusion with those who would hand over state secrets about nukes to ROGUE GOVERMENTS putting us ALL at risk. Whos is the biggest dealer of WMD of all - here's a part of the answer. Canada!! Oh, Canada - you are going to be brought to your ankles if you don't WAKE UP! Off you knees and write your MPs demanding an inquirty. Start filing complaints with INternational Criminal Court. We need a BREWSTER JENNINGS OF OUR OWN And I volunteer to work for them. As Canadians we cannot rely on the US intel "community" ..
Do these things now .. and demand REAL oversight of intel operations. They've known about this all along. Why are there no Canadian arrest warrants? Why Bill Clinton allowed in this country? What investigations of improper securities transactions are underway? What Ministers of Cabinet are going to do their jobs and be accountable? Maxime Bernier, I KNOW you troll this blog in the middle of the night? Why aren't you SPEAKING OUT? Where the hell is any leadership in the Canadian Parliament? How can they be justifying their taxpayer paid salaries ??? 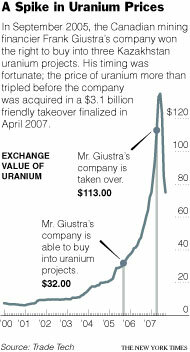 Vancouver mining financier Frank Giustra is making headlines today. 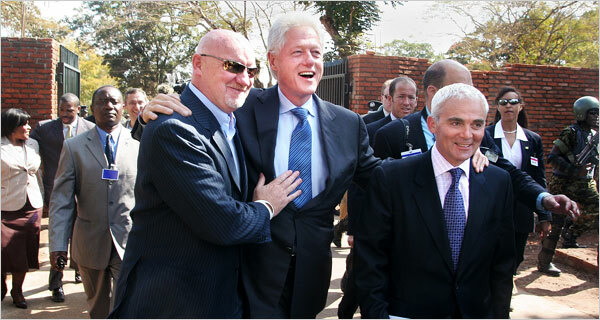 DONATING MILLIONS Former President Bill Clinton with Sir Tom Hunter, left, and Frank Giustra, major donors to Mr. Clinton’s charitable foundation. JO BECKER and DON VAN NATTA Jr. The latest political news from around the nation. Join the discussion. 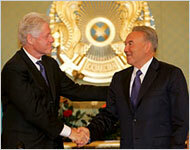 HIGH-LEVEL MEETING Mr. Clinton with Nursultan A. Nazarbayev, president of Kazakhstan, in September 2005.